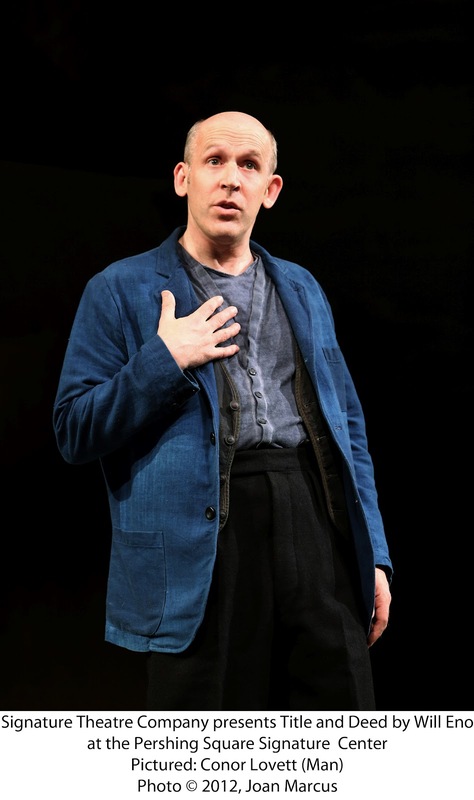 How It’s Irish: Conor Lovett, who performs this one-man piece, is the star of Gare St Lazare Players Ireland, and the play is directed by his wife, Judy Hegarty Lovett. The play opened at Signature Theatre on May 20, and runs through June 17. Conor Lovett is a great, great actor. He is for my money the finest interpreter of Beckett in the world. He formed Gare St Lazare Players Ireland in 1996, an offshoot of Chicago’s Gare St Lazare Players, with his wife Judy Hegarty Lovett, who directs. Someday I’d like to see him in a play. He’s currently appearing in Will Eno’s Title and Deed, which premiered in Ireland last summer and which, according to notes, was written with him in mind. Much of the credit clearly belongs to Judy Hegarty Lovett for the precision and nuance of his work. Eno is the author of the critically acclaimed Thom Pain Based on Nothing. He’s a Pulitzer Prize finalist and Horton Foote Prize winner, and he’s been compared to Samuel Beckett by the New York Times. 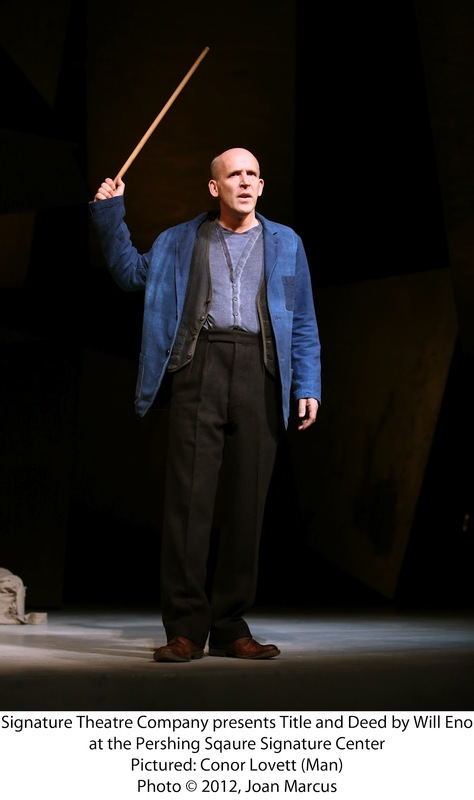 Like the characters Lovett has played in Beckett’s First Love and The End, the unnamed character in Title and Deed is a lost soul, with odd memories and types of logic. Like them, too, he’s unapologetic. He’s somewhat less pathetic, somehow, than Beckett’s tramps, maybe because he keeps telling us not to feel sorry for him. This Christ-like sentiment is never repeated, but Eno clearly wants us to see the Man as a Holy Fool, if not more. From time to time he tells us of his physical complaints, which include a strange noise in his jaw and thunder howling in his head. He also carries a shoulder bag and in it, as you’d expect from a Beckett character, are strange odds and ends, including a stick that he jokes he will play for us later, before immediately undercutting the thought. Lovett charms by making each observation, each self-deprecating aside, seem fresh. From time to time he says “what next,” as if he’s lost his train of thought, before finding it again – a little thing that is almost impossible for actors to pull off convincingly. He uses hand gestures so precisely they have an eloquence all their own. Man tells us stories of the picturesque and disturbing customs of his homeland, a place so small he’s sure we haven’t heard of it (and which Eno archly never names). In that place, when a person is in love, he sits at the end of the street of the beloved, very still, except for the occasional flinch (“flinch” was a word the character kept coming back to), and then, finally, played the saddest instrument he didn’t know how to play, while the beloved leaned out the window and tried to sing along. Most people choose the cello, he tells us. He chose the tuba. That’s whimsical, and there’s a strong strain of whimsy in Title and Deed. It’s in Lovett’s performance, the way he talked directly to us and clearly brought us in to his world, and the meditations about home. He says he is “unhomed,” a state a person carries with him if he has nothing good inside of him, which he says he has not. He keeps telling us that, but Lovett is so gentle, so likeable, that it’s just impossible to believe. The trouble is that the play has nothing at stake. There’s really nothing we’re waiting to see happen. At 70 minutes, Title and Deed is at least 30 minutes too long. It would be a gentle, haunting one-act, but as a full-length play it wears out its welcome. The Man has some aches and pains (again, very Beckettian); he talks about love; home; and concludes that it’s strange to be a person. Eno has a deft hand with a subversive one-liner. In this, he’s very Irish, and I can understand his appeal to Lovett and vice versa. You don’t see the “and left” coming, so there’s a laugh. But as a meditation on mortality, Title and Deed just doesn’t have the power of a Beckett play. But as Man would no doubt say – what does? And spending time with Lovett is never a waste of time, even though time on earth is limited. It’s a cliché to be sure, but I’d go hear him read the phonebook. Still. I’d love to see him in a play, with another actor, one of these days. To see him in action would set his skills like a gemstone in gold. Title and Deed is only pretty costume. 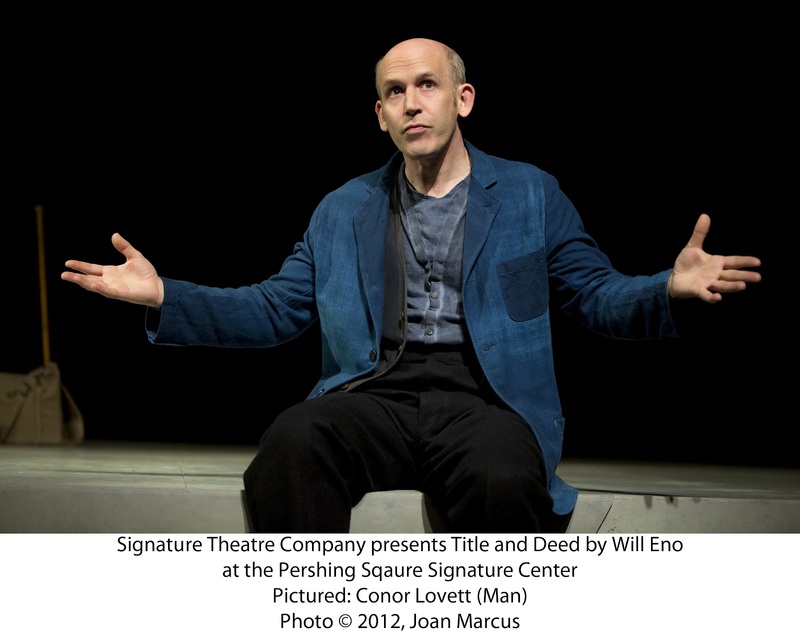 Tickets for TITLE AND DEED are available by calling Signature at (212) 244-7529, online by visting www.signaturetheatre.org, or by visiting the Pershing Square Signature Center (480 West 42nd Street). For more information on Signature Theatre Company, please visit www.signaturetheatre.org.